Here are detailed notes on constructing tailored trousers. They are provided for myself and my daughter, but may be of interest to others making pants. 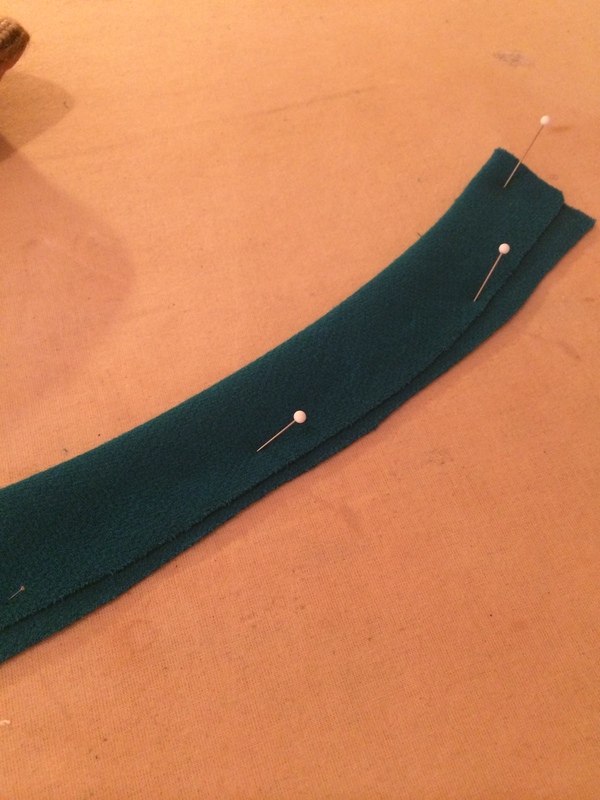 The first steps are covered here; this post covers waist band, fastening, hems and finishing. These trousers have a contour waistband for best fit and comfort in wear. I find a conventional waist band stands too proud of the body, and where we want the waist band to closely fit into the waist and take on its curve this is the best style of waist band to select. It is quite common in vintage patterns, but quite rare on modern ones, and of course virtually unheard of on RTW. If you are making a close-fitting tailored skirt, or tailored trousers, it can give you a very nice finish. Cut a wide bias strip for the belt. You can certainly use two strips and join them at CB. If you lack sufficient fabric to create a true cross grain waist band, you can use the best cross grain you can get. To get the right size measure the waist (or place where you want the waist band which may be a little lower or higher), divide by two, and add 1 inch to one side and two inches to the other. When you attach them the longer side matches the side you have your lapped fly coming over. Right sides together attach the two pieces, press and allow to dry. 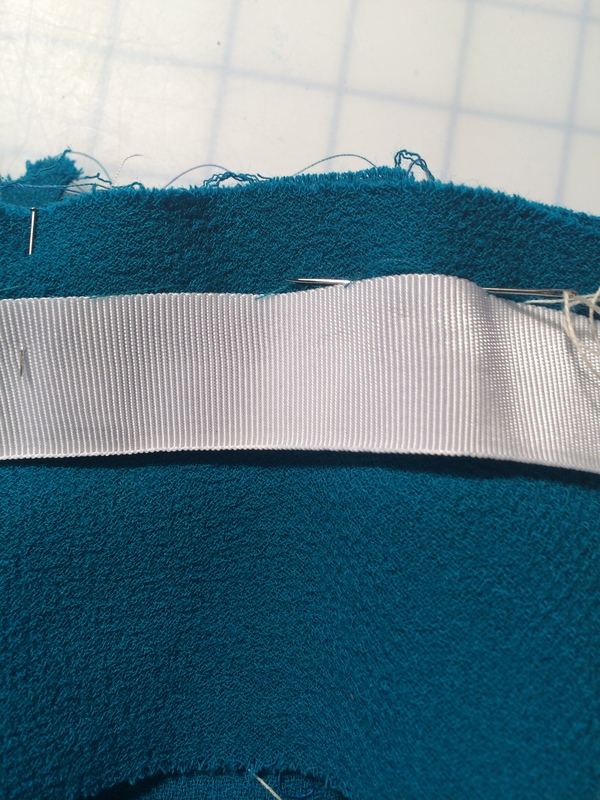 Now lay the waist band out on a flat surface and with a piece of chalk and a set square, mark the 5/8″ stitch line on the inside of the waist band. Cut a piece of curved Petersham of the right width (I use 1″) to the length of your waist plus 1.5″ for the overlap, and carefully, using a slip stitch,sew the longer side to this line. This is the base of the waist band which will be attached to your trousers. The shorter edge will come higher up into your waist. Now, fold over the bias strip over the Petersham to form the waist band. 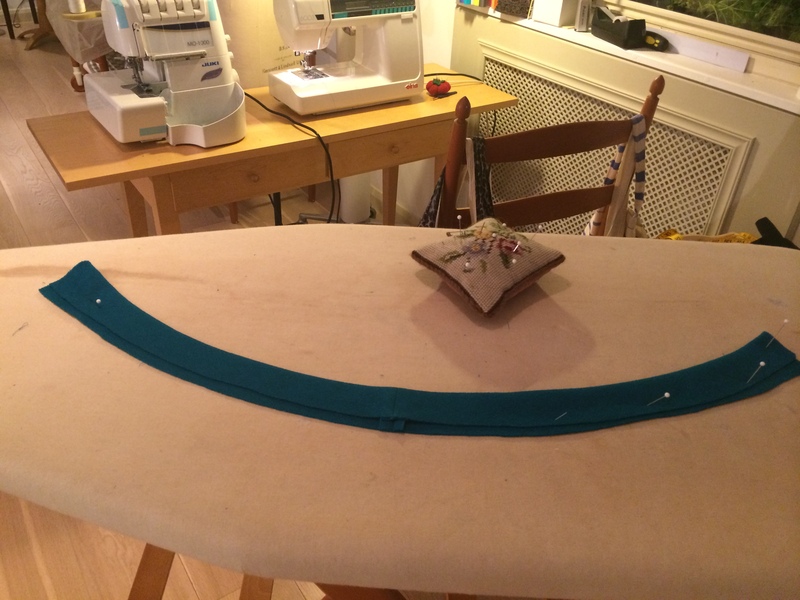 Pin it to the ironing board in a pleasing curve. 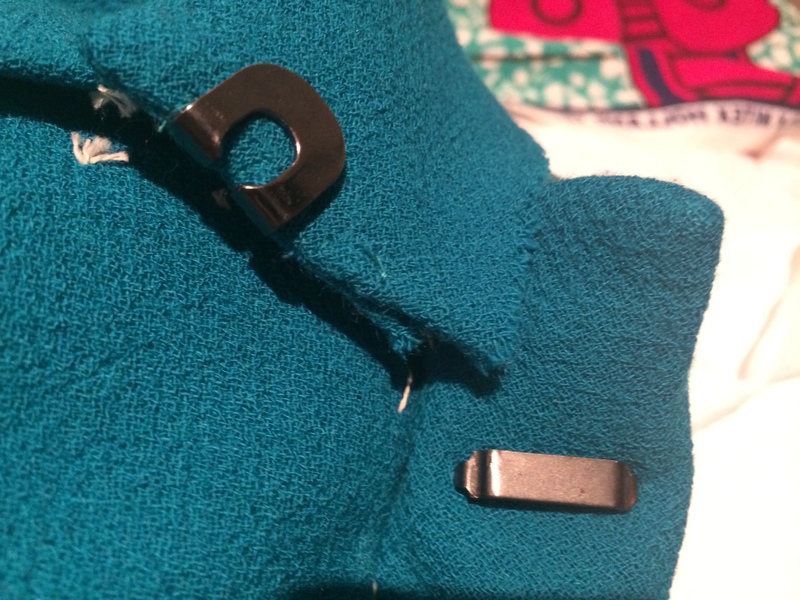 Once the waist band looks even, press it on the wrong side to set the shape of the fabric. Lining up the seam in the waist band with the CB seam of the trousers, right side together, pin the waist band to the trousers, making sure it is even and that you have the slight overlap in the right place. Mark on the Petersham, using a washable pen, where you exactly want the end of the waist band to be. This should be lined up with the underlap and extend about an inch with the overlap. 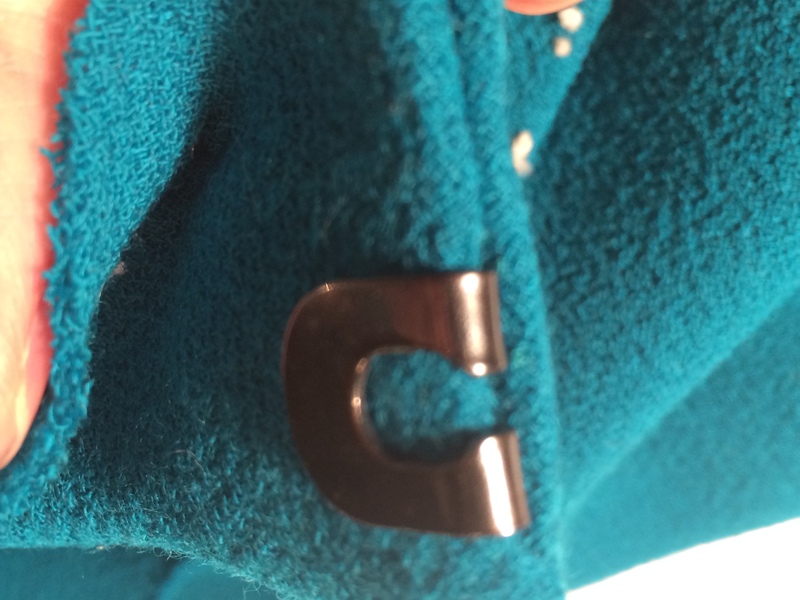 Also mark exactly where you want the hook and eye to be. Now baste the waist band in stitching along the stitching line. You will need to mark with a tailors tack or chalk where the two sides of the waist band meet. This is to ensure that the front of the trousers look smart and professional. The longer than necessary zip is still visible. Now that you have basted the waist band in place check it looks nice and even and ends exactly where you want it to. You may wish to slightly trim the length of the Petersham at this stage. Stitch the waist band to the trousers. Now bring the zip pull down to just the right position on the trousers, trimming off the excess at right angles. 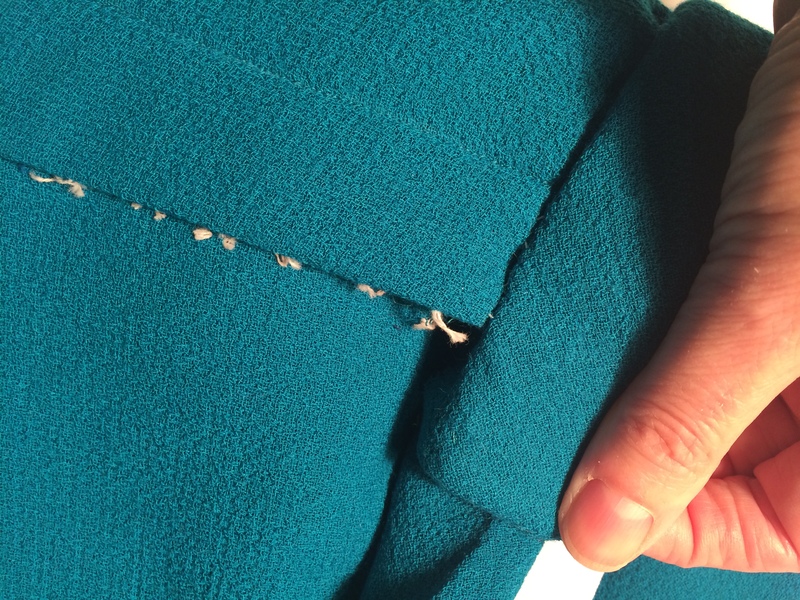 Trim the seams fairly aggressively but safely, leaving the longest piece closest to the outside of the garment. Now we want to put in the bar for the hook to attach to. 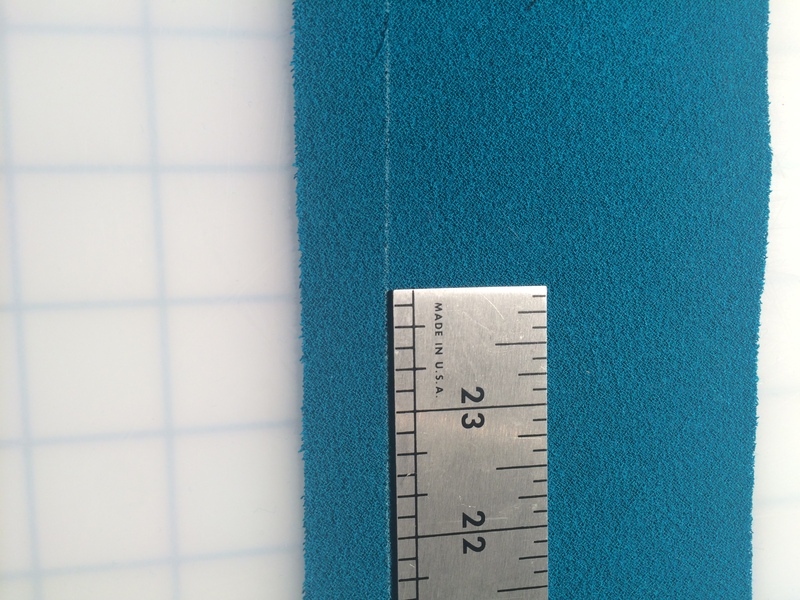 The spot is where the extension meets the waist band. 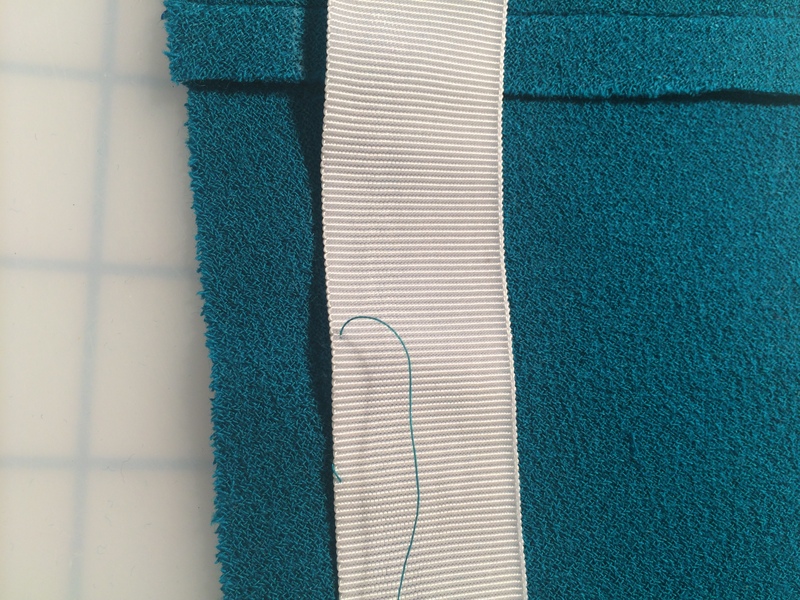 Your hook with extend just a tiny bit beyond the edge of the fabric so the bar must also be placed just slightly beyond the overlap. If you are using a bar which goes through the cloth (recommended) you need to put it after you have sewn the waistband to the trousers permanently. If you use one which is stitched to the waist band you should do this at the end of the construction. T he bar is also best attached by undoing the short end of the overlap for a few stitches in the middle withan unpicker, to create a slot into which you can push the extension of your bar. This creates a very neat finish, and if you do it now, you can stitch it to the Petersham neatly and firmly before you close up the waist band. Now you can finish attaching the waist band. Bring the inside piece down over the Petersham, ensuring all the seam allowances are pressed up wards and caught inside the waist band. You can either turn it up and inside, or to give a flatter finish you can leave the edges raw (as it is bias it will not unravel). Either attach by hand or over stitch in the ditch on the outside of the trousers. Try on the trousers and decide where you want the hem to finish. On this pair they are quite short (7/8th length) to show the ankle. Pin them all round to mark where they will finish. Take them off carefully. Measure the depth of the hem at specific point and replicate this on both hems. Pin them up. Press lightly without squashing the roundness of the leg, using the tip of the iron. 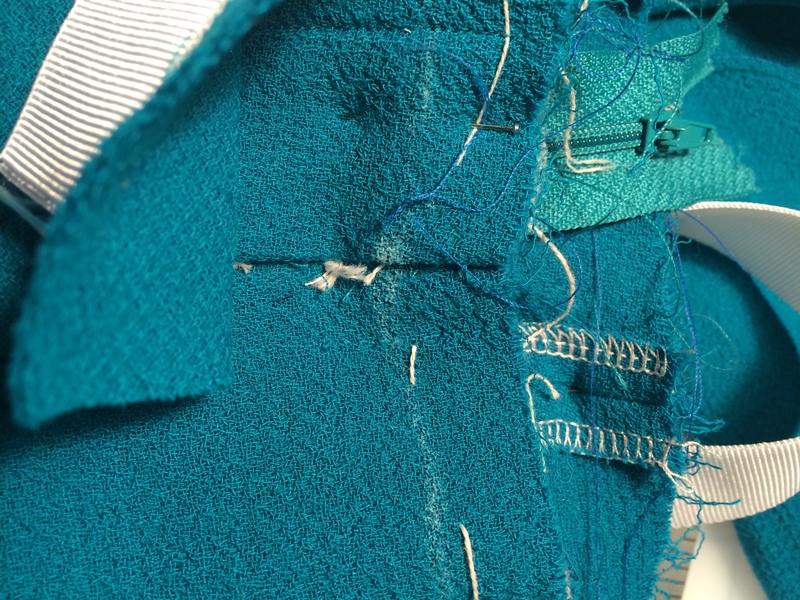 Turn inside out and hem on the overlocked edge, picking up just one or two threads each time, using a neat slip stitch. Press again, again with care. A damp linen cloth can be used to ensure the crease is nice and crisp. Allow to cool. Remove the tailors’ tacks, the basting at the pockets and any other threads. Thanks very much for sharing this detailed information. It will definitely come in handy! The pants look great.